This is an okay comic book-type movie, even interesting at some points, but it isn’t anything new or special. Arnold revitalizes his stoic catch-phrase-rapping character with few steps lost, save for the furrowed face lines in close-up. The FBI’s incompetence, and the subsequent waste of tax dollars in trying to catch an escaped convict – during our ongoing debt crisis – is laughable, and the use of firearms and the way that people die is questionable timing one month after Newtown. But hell, these type of movies don’t care and neither did the preview audience in attendance, cheering each quality kill. Sheriff Ray Owens (Schwarzenegger) of Sommerton Junction, Arizona, is a lawman with a past, a former Los Angeles police officer who lost his entire unit in a drug war shoot out. He’s content in his sleepy town, aided by deputies Mike (Luis Guzmán), Sarah (Jamie Alexander) and Jerry (Zach Gilford). In faraway Las Vegas, a death row prisoner transfer is taking place by the FBI. The Mexican drug lord Gabriel Cortez (Eduardo Noriega) somehow is able to make his escape during the transfer, much to the consternation of gruff Agent John Bannister (Forest Whitaker). There are a couple of mysterious truckers in Sommerton, and something doesn’t seem right to Sheriff Ray. It turns out they are building a bridge across a canyon nearby, a bridge to the Mexican border that their boss Cortez will use to get out of America. They kill a local farmer (Harry Dean Stanton) to set up the construction camp, and this begins a series of events in which a gun battle kills Deputy Jerry. 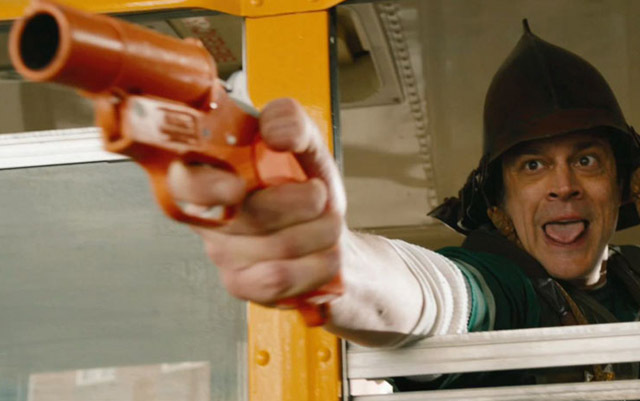 Sheriff Ray is now the law, and recruits local troublemaker Frank (Rodrigo Santoro) and gun museum owner Lewis (Johnny Knoxville) to join what is left of his officers to help fend off the usurpers. The complex description is included just to show how many hoops the narrative had to jump through to make sure Arnold has his confrontation, and enough weaponry to get the job done. The action director of the film is the South Korean Jee-woon Kim, and he manages to juggle all the story points and action with some deft touches. He also has a bunch of original sequences, including Cortez’s escape, the town square gun battle and a driving sequence through a corn field that had a strange beauty. It’s the script that skewers the atmosphere. There are a bunch of howlers in it, including an FBI that wastes more money than Halliburton on a bender. Cortez escapes in a souped-up Corvette (1000 HP, yeah baby!) and the FBI helicopter that follows him seems to function as his key light. What, no sharpshooters? Forest Whitaker is provocative even in the smallest roles, but even he can’t breathe life into his FBI bureaucrat, except to stay on the sidelines and make goo-goo eyes at Sheriff Arnold near the conclusion. The film is ultra violent, with many of the kills achieved with head shots, ala how John F. Kennedy was assassinated (is it a Jee-woon Kim trademark?). The use of guns are prolific, right in the middle of our country’s gun debate. Well, how the heck are we to defend ourselves against race-car driving drug lords, if not for a World War II style Gatling gun obtained through a small town weapons museum? Debate that, Congress. You get what you pay for at an Arnold Schwarzenegger action picture, what did you expect from the Governator, Shakespeare in the Park? It was a little disconcerting to see the 66-year-old wrestling hand to hand with a young criminal on a bridge, but at least his bronzer make-up never smeared.